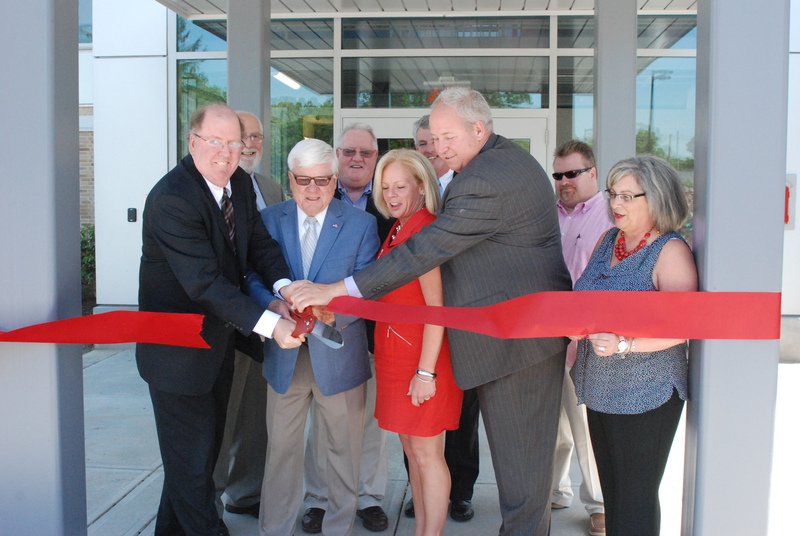 Video project highlights construction completion for RHS! The most recent, Rockland High School’s new look, three years in the making but well worth the wait! The Veritas staff’s Molly Garrity surveyed the soon-to-be senior class to find out what they wish to accomplish during their senior year. With these ambitions, the last year of high school is going to be an exciting one for the Class of 2014! This is what she found. Following is an interview with Mr. Flanagan produced by Tyler Quam and Jaqweal Holit. While enjoying all his classes, Mr. Flanagan says his favorite class to teach has been AP psychology. “Kids are really interested in a class like that because it’s so relevant,” he explained. If you see Mr. Flanagan in these last days of his teaching career, be sure to wish him a happy retirement. 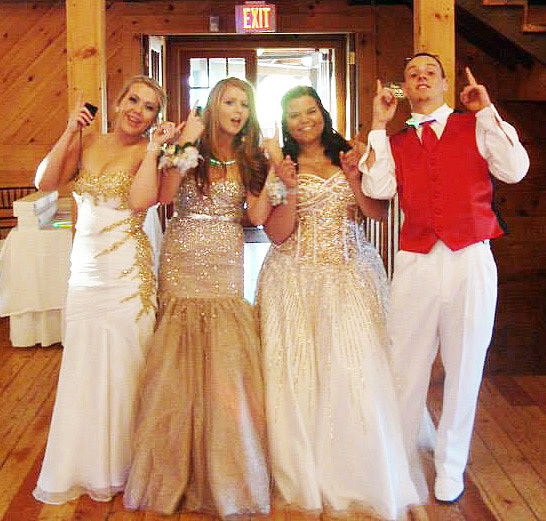 Kaitlyn Sullivan, Molly Garrity, Georgia Panagiotidis, and Joseph Rizzotto, the class officers for the Class of 2014, at the Junior Prom. As the school year comes to a close, class officer positions have been chosen for next year. The senior class positions remained exactly the same as this past school year. The Senior Class officers are as follows: President- Molly Garrity; Vice President: Kate Sullivan; Treasurer: Joe Rizzotto; and Secretary: Georgia Panagiotidis. In contrast to the seniors, both the sophomore and junior classes will have a very new set of officers. The sophomore class elections came down to a run-off between Haley McCray and Ryan Palmer. The class elected Mr. Ryan Palmer to be their new sophomore class president. Mr. Rowe says Ryan is “a well liked kid who will look to motivate his class to the next level.” Caitlin Yanizzi, Abby Kinlin, and Shawn Carney will also serve as officers for the 2013-2014 school year. Nicole Cook was elected the new class president for the upcoming junior class. Student Government advisor Mr. Greg Rowe has a high regard for Nicole’s leadership. He explains, “Nicole has been involved in student activities since she came to RHS and I’m sure she will expand upon that.” Pearse McNally, Dennis McPeck, and Alex Pigeon will also serve as officers for the junior class next year. Principal Alan Cron who is on the left holding the banner, announced to the School Committee that RHS has been re-accredited. With him are teachers, Mr. Murphy, Mr. Grimmett, Ms. McDonough, Ms. Cahill, Ms. Paulding, Mrs. Patton, Mrs. Thompson and Mr. Rowe. After six long years of waiting, the time has finally come. At a May 2nd faculty meeting Principal Alan Cron informed the faculty and staff of RHS that Rockland High School has now been fully accredited by the New England Association of Schools and Colleges (NEASC). NEASC is responsible for the accreditation of over 2000 institutions in the New England region, in levels ranging from pre-K through university. The accreditation process uses key values of self-reflection, peer review and best practices to evaluate each school. The proud superintendent also acknowledged that the credit for this should not solely be given to the recent renovations, but also to the faculty’s work in core values and curriculum. After the announcement, the meeting quickly transformed into a celebration of Rockland’s latest achievement. He also shared his conversation with Robert Littlefield, chair of the committee responsible for ending the probation, in which he was told “the committee was pleased with the work done and the school committee’s work and resources,“ and that the decision was made unanimously. 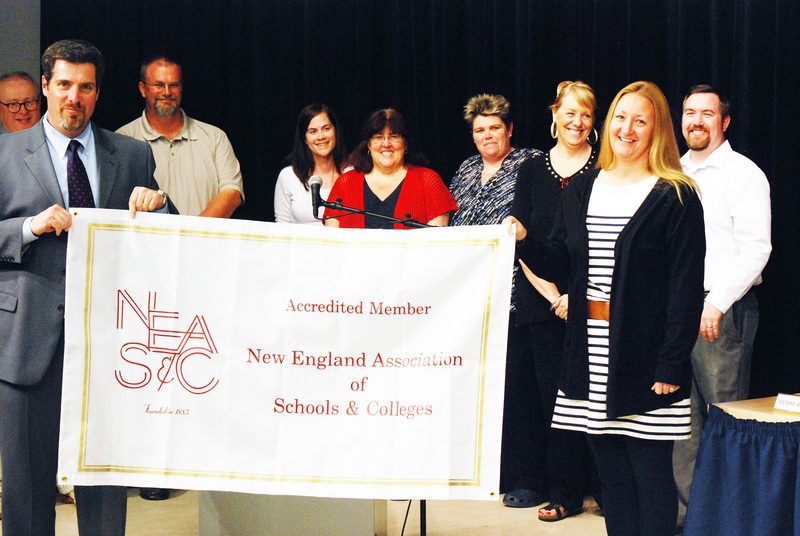 A banner was presented during the meeting that represents RHS’s accreditation by NEASC. Plans have been made to hang the banner somewhere toward the front of the building, to showcase Rockland’s continuing prestige. 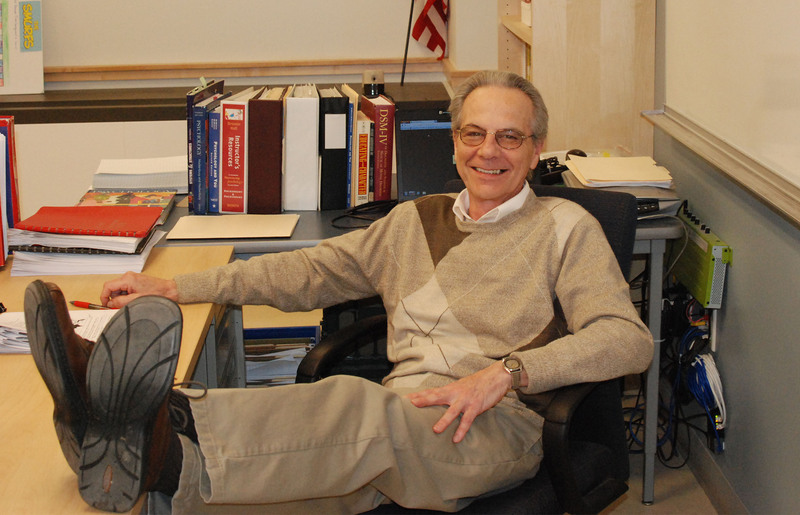 Veritas staff reporter, Molly Garrity sat down with Louis Antonelli a graduate of Rockland High School’s Class of 1975 who was recently inducted into the Academic Hall of Fame. Lou is an editor and reporter for a daily newspaper in Texas as well as a published science fiction short story writer. Timothy Souza, Carol Souza, Louis Antonelli and Stephen Sangster were inducted into the RHS Academic Hall of Fame. 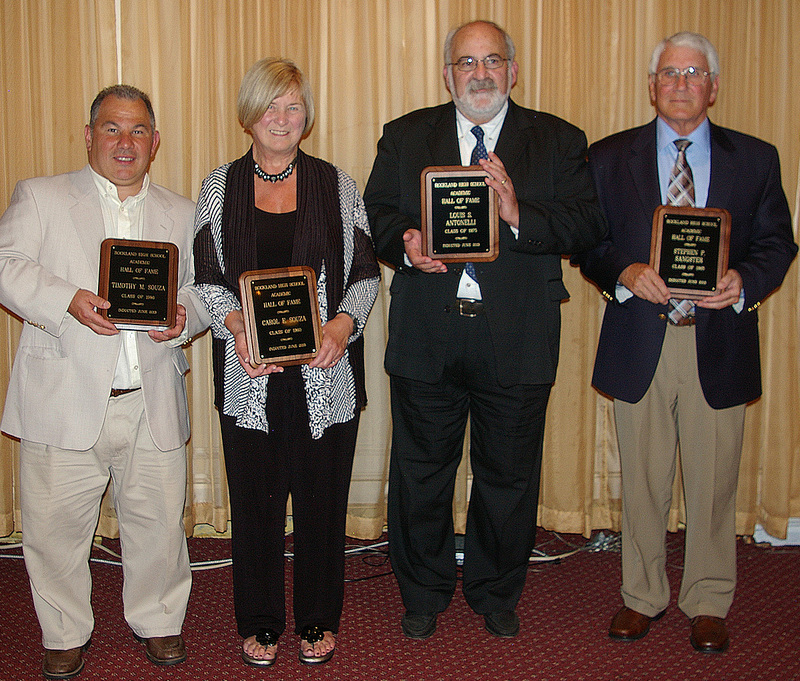 Four former students of Rockland High School were inducted into the Academic Hall of Fame on June 5th. The inductees included two former RHS teachers, a successful restaurant manager, as well as a successful journalist/science fiction writer. Mrs. Susan Patton, assistant principal at RHS and chairperson of the Hall of Fame committee, introduced each inductee. Timothy Souza, Class of 1986, is a successful chef and owner of the Five Bays Bistro in Osterville. Souza has given cooking demonstrations at RHS since he graduated and he also dedicates time to teach inmates how to cook at a local prison. Carol Souza, Class of 1960, taught cooking and sewing in the Home Economics Department at RHS before she retired seven years ago. She graduated from Keene State College. She continues to teach night school for the Rockland Public Schools and a cooking summer camp for students. Louis Antonelli, Class of 1975, is a journalist and a successful science fiction short story writer who now lives in Mount Pleasant, Texas. His third collection of science fiction short stories will be out in the fall. He was editor of the Rockland High School student newspaper, the Veritas for two and a half years while an RHS student. His sister, Angela Antonelli, was inducted into the Hall of Fame in 2010. Stephen Sangster, Class of 1965, spent his entire career in education at Rockland High, where he was a successful coach, teacher and finally the principal for 15 years. He served as an administrator of the Massachusetts Interscholastic Athletic Association during his tenure as principal. He retired last year after 41 years in education. The induction ceremony was held together with the Rockland High School Academic Awards Banquet which honors academic achievers from grades 9-11 at RHS. In attendance were students and their families along with faculty and staff from RHS, including many former teachers. Congratulations to these four newest members of Rockland High School’s Hall of Fame. For underclassmen award winners information go to this link in our photo gallery.